Three lives collide when a local woman goes missing, catapulting a New Jersey homicide detective, a state trooper and a motor vehicles supervisor into an intricate game of cat and mouse. In a struggle between reputation and redemption, how far will each man go to save himself? Dan Long is a consultant pharmacist who grew up in Philadelphia and lives in New Jersey. 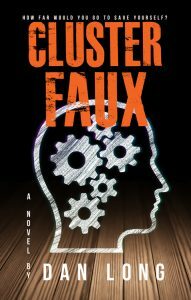 Cluster Faux is his first novel.